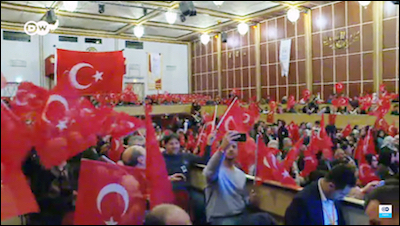 Hundreds of Turkish expatriates in Germany attend a political rally, addressed by Turkey's Sports Minister Akif Cagatay Kilic, in March 2016. To the European Union, which Turkey theoretically aspires to join, he said: "If there are any Nazis, it is you who are the Nazis." Erdogan seems to think that he can tame Europe by blackmailing it. Ironically, the Turkish ire against the West, in a recent row between several European capitals and Ankara (over Erdogan's ambitions to hold political rallies across Europe to address millions of Turkish expats), reveals the unmistakable and deep-rooted anti-Semitism among Erdogan's fans. Hundreds of Turkish protesters in the Dutch port city of Rotterdam hurled stones at the police and shouted "Allahu akbar" -- Arabic for "Allah is the greatest." Then, some in the crowd, in a protest that was exclusively a dispute between Turkey and the Netherlands, shouted "cancer Jews." 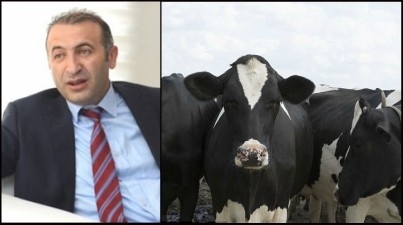 "The Dutch Holstein cows have become very common in our country," says Bulent Tunc, the head of the Turkish Association of Red Meat Producers. "But this breed is starting to cause serious problems." The official rhetoric in Ankara, however, unveils the irreversible incompatibility between the democratic cultures of Europe and Turkey. For Erdogan, "the spirit of fascism is running wild" in Europe. According to his foreign minister, Mevlut Cavusoglu, Europe is "heading toward an abyss." And it is not just the rhetoric. Part of the inflammatory anti-Western Turkish rhetoric and exploits may be aiming at luring an increasingly isolated and nationalistic voter base ahead of a critical referendum on April 16 that aims significantly to broaden Erdogan's presidential powers. But it is also about the fact that Erdogan views and portrays himself as the global champion of an opaque "Muslim cause," under Turkish [read: Erdogan's] caliphate-like leadership against the "hostile" West. As Islamists know that they cannot defeat the West by using hard power, it is about "soft jihad." "Soon religious wars will break out in Europe," he said. "That's the way it's going." But how do Turkish (and other) Islamists think they can win future religious wars? How do they think their primary warfare instrument, soft power, would work for an ultimate Islamic victory over an "infidel" civilization? Go live in better neighbourhoods. Drive the best cars. Live in the best houses. Make not three, but five children. Because you are the future of Europe. That will be the best response to the injustices against you. It is time to recall the poem Erdogan recited at a public rally back in 1999: "The mosques are our barracks, the domes our helmets, the minarets our bayonets and the faithful our soldiers."